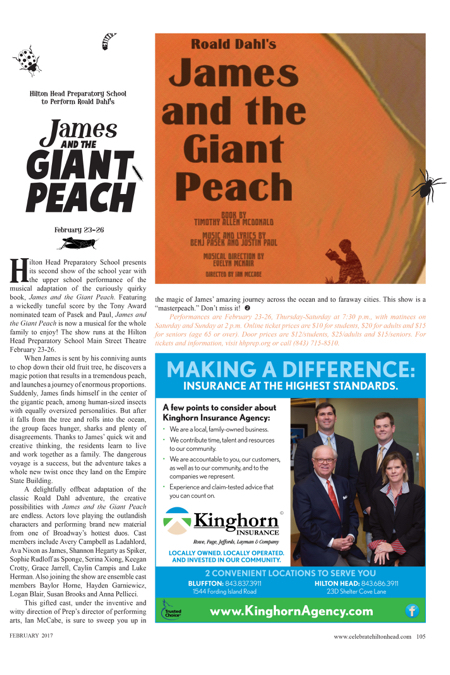 Hilton Head Preparatory School presents its second show of the school year with the upper school performance of the musical adaptation of the curiously quirky book, James and the Giant Peach. Featuring a wickedly tuneful score by the Tony Award nominated team of Pasek and Paul, James and the Giant Peach is now a musical for the whole family to enjoy! The show runs at the Hilton Head Preparatory School Main Street Theatre February 23-26. When James is sent by his conniving aunts to chop down their old fruit tree, he discovers a magic potion that results in a tremendous peach, and launches a journey of enormous proportions. Suddenly, James finds himself in the center of the gigantic peach, among human-sized insects with equally oversized personalities. But after it falls from the tree and rolls into the ocean, the group faces hunger, sharks and plenty of disagreements. Thanks to James’ quick wit and creative thinking, the residents learn to live and work together as a family. The dangerous voyage is a success, but the adventure takes a whole new twist once they land on the Empire State Building. A delightfully offbeat adaptation of the classic Roald Dahl adventure, the creative possibilities with James and the Giant Peach are endless. Actors love playing the outlandish characters and performing brand new material from one of Broadway’s hottest duos. Cast members include Avery Campbell as Ladahlord, Ava Nixon as James, Shannon Hegarty as Spiker, Sophie Rudloff as Sponge, Serina Xiong, Keegan Crotty, Grace Jarrell, Caylin Campis and Luke Herman. Also joining the show are ensemble cast members Baylor Horne, Hayden Garniewicz, Logan Blair, Susan Brooks and Anna Pellicci. This gifted cast, under the inventive and witty direction of Prep’s director of performing arts, Ian McCabe, is sure to sweep you up in the magic of James’ amazing journey across the ocean and to faraway cities. This show is a “masterpeach.” Don’t miss it! Performances are February 23-26, Thursday-Saturday at 7:30 p.m., with matinees on Saturday and Sunday at 2 p.m. Online ticket prices are $10 for students, $20 for adults and $15 for seniors (age 65 or over). Door prices are $12/students, $25/adults and $15/seniors. For tickets and information, visit hhprep.org or call (843) 715-8510. A Line in the Sand: Is everything really a keepsake?